I haven't written about sensory bins in a long time. 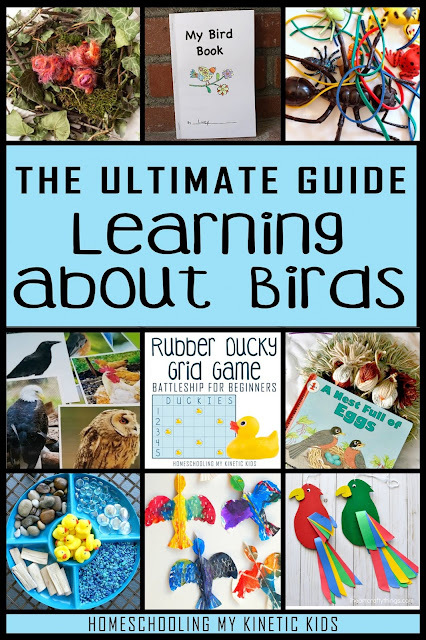 They're one of my kids' favorite learning activity and the thing they ask for most often. Usually, we do something quick and don't even take pictures of them, so they never make it into a blog post or on social media. I'm trying to be better at both (wink). 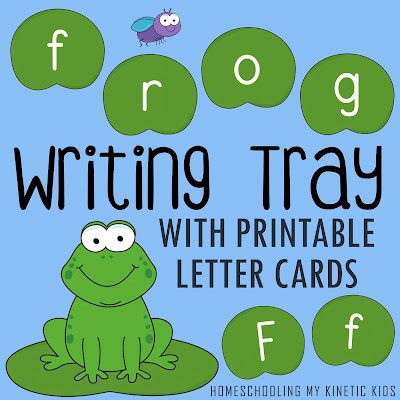 Yesterday, I debuted Frog Letter Cards for use with a salt writing tray, but I also wanted to show how great they would be in a pond sensory bin! For this bin, I used a bunch of our dyed rice to make a colorful pond. To dye rice, add an amount of rice in a zip top bag. I use a sandwich size bag and add 1/4 cup to 1 cup of rice. To your rice, add a bit of food coloring, paint, or some other dye and a tiny bit of rubbing alcohol. Seal the bag and squish the contents around until the rice is colored. Dump the rice onto a cookie sheet in a thin layer to dry. After an hour or so, the rice should be safe to handle without dying your hands. Mix colors after their dried or leave the separate for the kids to mix. When they're done, store in a zip top bag. 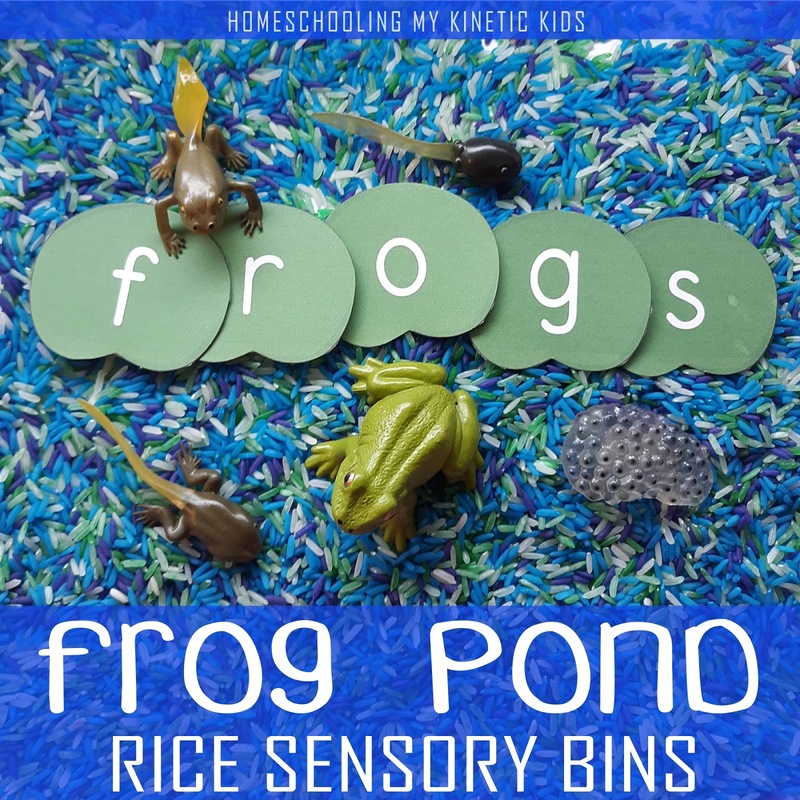 I like to add interesting objects to my sensory bin to promote discovery and learning. I already mentioned how good the Lilypad Letter Cards are for encouraging spelling practice and pretend play. 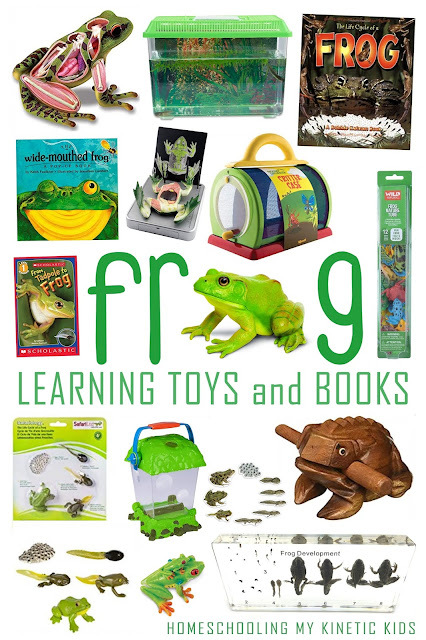 I also highly recommend the Safari Ltd Frog Life Cycle set of tadpole and frog figurines for exploring metamorphosis. It's also fun to add some tools like these scoopers, which also help train and strengthen hands for scissor work. 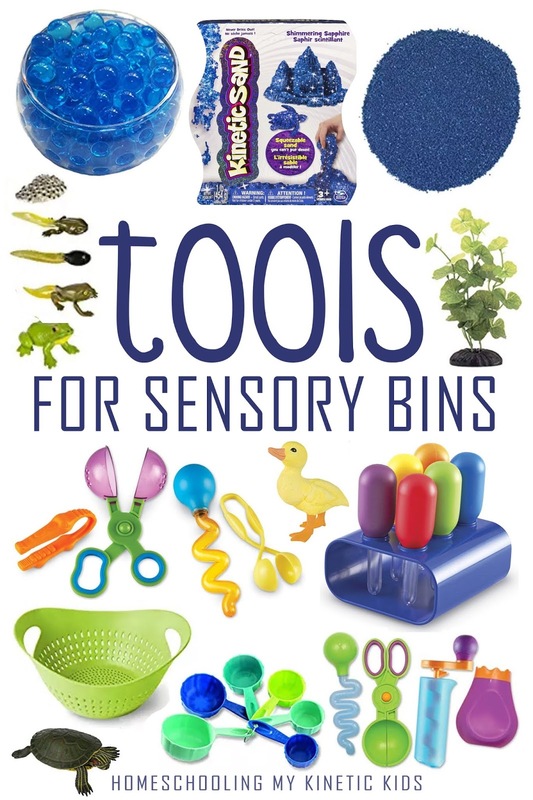 Let me know in the comments your favorite sensory bin! 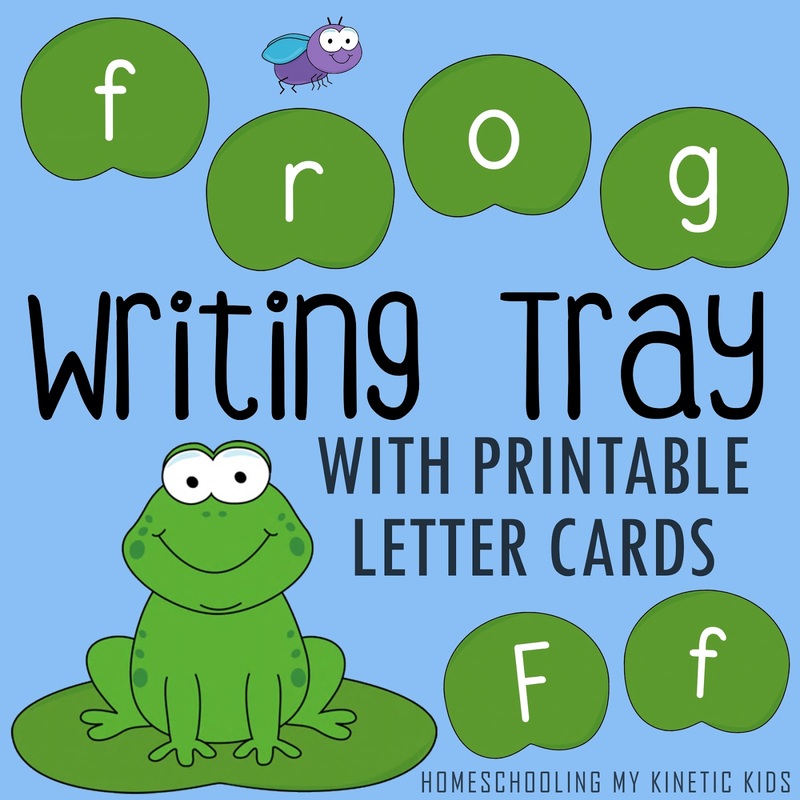 When I was working on updating my old Montessori-inspired Salt Trays post from several years ago, I realized that I hadn't done a custom writing tray since my apple pie spiced one in 2015. 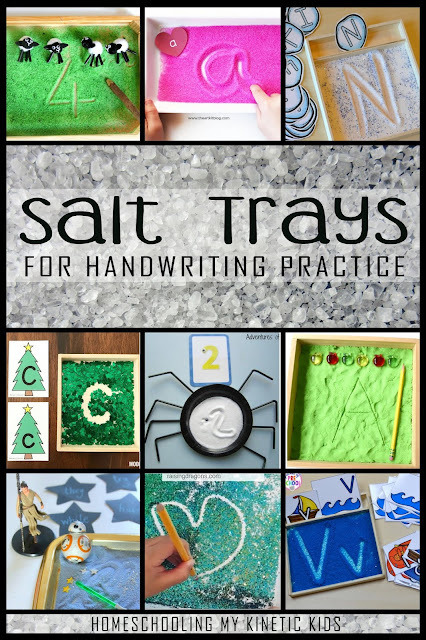 In the salt tray roundup post, I highlighted over 30 themed ideas. I'm not claiming to have found every single idea and article in the world, but I was very surprised and pleased to not find a frog themed one in my hunt. 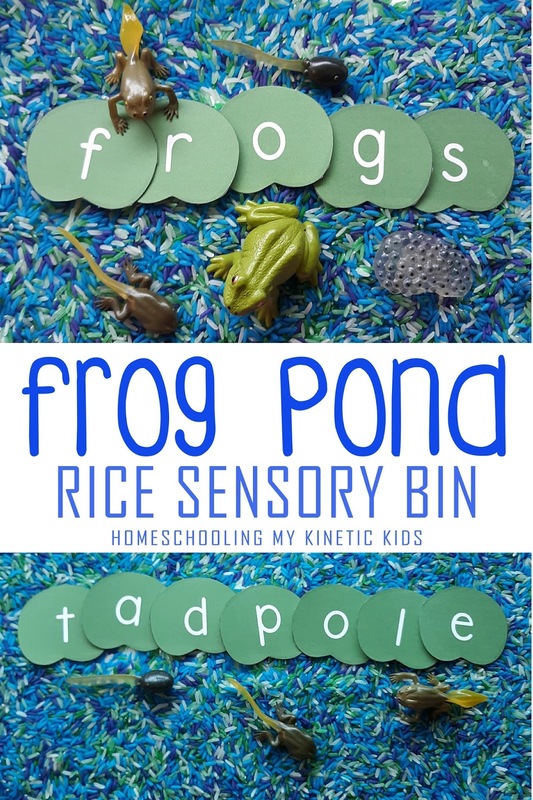 If you've been following this blog for a while you'll know that frogs are our thing. The original name of this blog was "In Our Pond" with a heavy emphasis on animals in the pond. I even thought that our homeschool would be dominated by children sitting on lilypads for lessons (hahaha). Even though we've left the pond far behind, we still feel ourselves drawn back to the pond every spring/summer. All winter long, Dragonfly (age 7) talks about wanting to find frogs, and we're talking this year about growing tadpoles if we can find some local. Scroll down to the bottom of the post if you want to see all our frog stuff. Once I was on the froggy path, the rest was very easy. 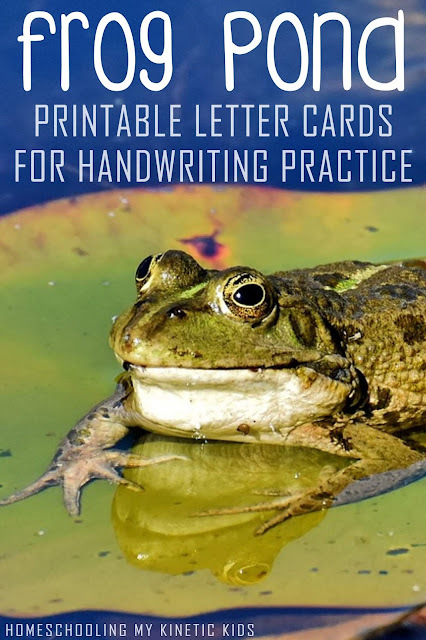 I used the lilypad and frog clip art from My Cute Graphics to create letter cards for every letter in the English alphabet. The lilypads are small enough to fit in an Altoid tin, which makes them a great take along activity, too. 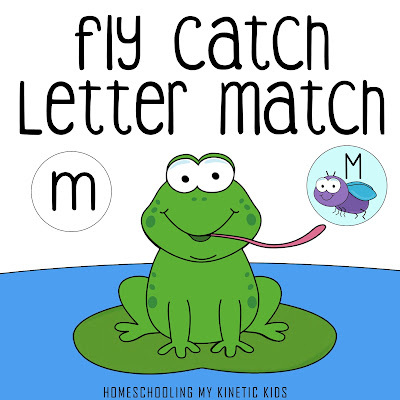 Work on letter identification by using the lilypads as flashcards or play a matching game with upper and lowercase letters. 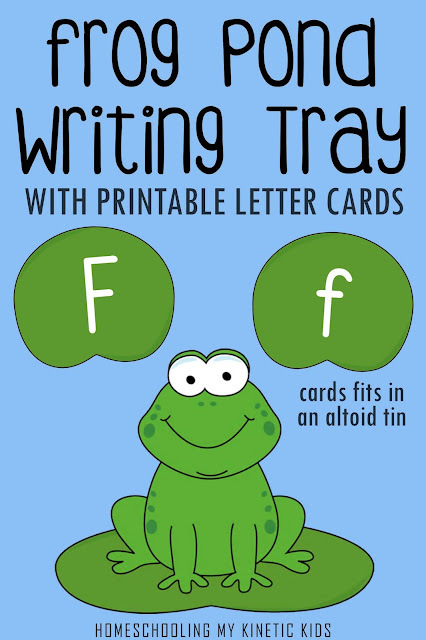 For extra fun, combine the letter cards with my Frog Life Cycle cards and the Safari Ltd Frog Life Cycle set. Kids can spell the words from the cards and match the life cycle pieces to the cards as they work. The salt could also be used for a sensory bin or small world play area. Some kids enjoy the gritty feeling of salt on their fingers, while others can't stand it. For my salt tray, I gave the kids a paintbrush for writing, but a twig pencil would also be appropriate and fun. 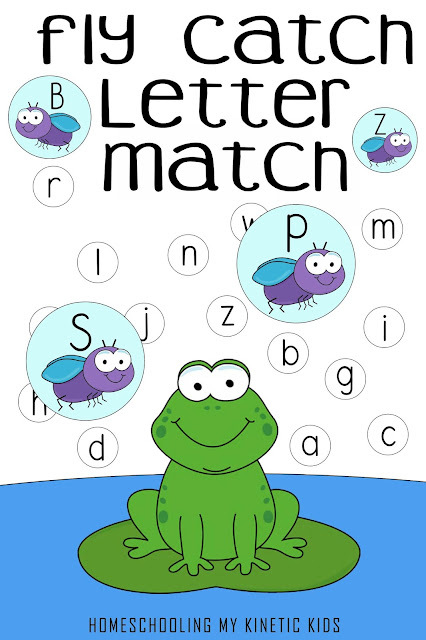 The PDF contains printable lilypad cards for both the uppercase and lowercase letters of the English alphabet. It also has a label for the Altoid tin, so you can affix it and store all the letters together. 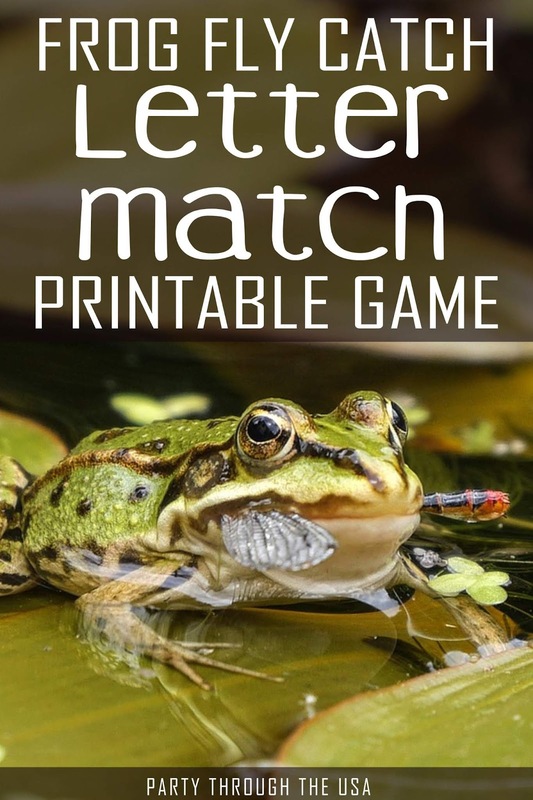 The letters are designed to be printed on two sides, so they can be used for a matching game. Either print two copies of each letter set or have kids match the uppercase letter with it's lowercase letter buddy. It's a great way to work on letter recognition. If you're worried about using all that ink, I recommend getting an HP Instant Ink printer. For a small monthly fee, HP makes sure that you never run out of ink again! When you start to run low, they send you a new cartridge right to your doorstep. We love that the printer is wireless and can be accessed through any device to print anything anywhere. It's a great value, too! To find out more, check out my Back-to-School post from two years ago. 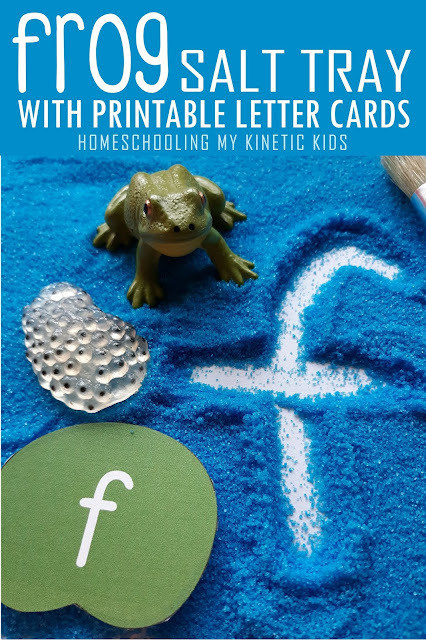 For more Montessori-inspired Salt Trays to match any homeschool theme you can dream up, click on the colored text or above picture. Over 30 ideas for every season, theme unit, topic, or whatever. Which themes would you like to see? It's officially springtime! The snow has melted, the birds are singing, and the woodpecker has visited for his annual rapping on our house. There are even candy eggs in the grocery store! 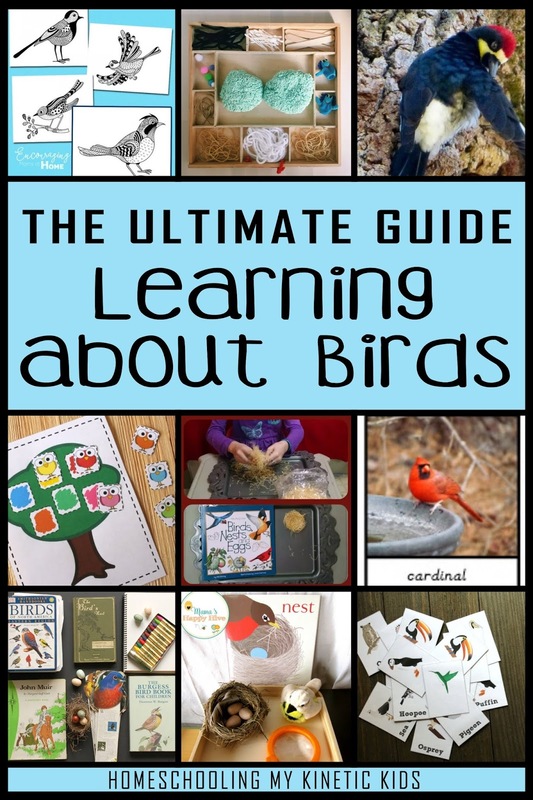 It's a great time to study birds, nests, and eggs! I called on my friends at the Kid Blogger Network for ideas and put together this giant round up of backyard bird resources for traditional classrooms and homeschoolers. 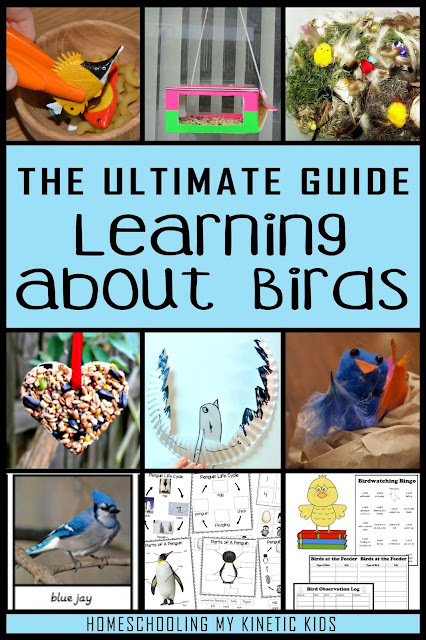 As always, I hope you find it helpful for putting together your own bird study this spring. 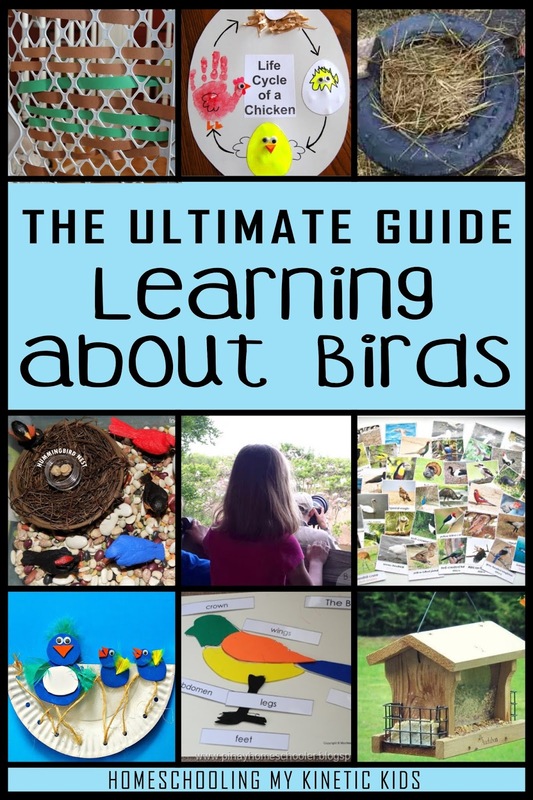 I think a good place to start your study is with basket or bag of birding supplies, either near a window of your house or near the backdoor for taking with you. In the bag, I would put a good pair of binoculars (such as the ones in the grid below), a sketching notebooks, and some pencils, colored pencils, or water colors for recording your findings. 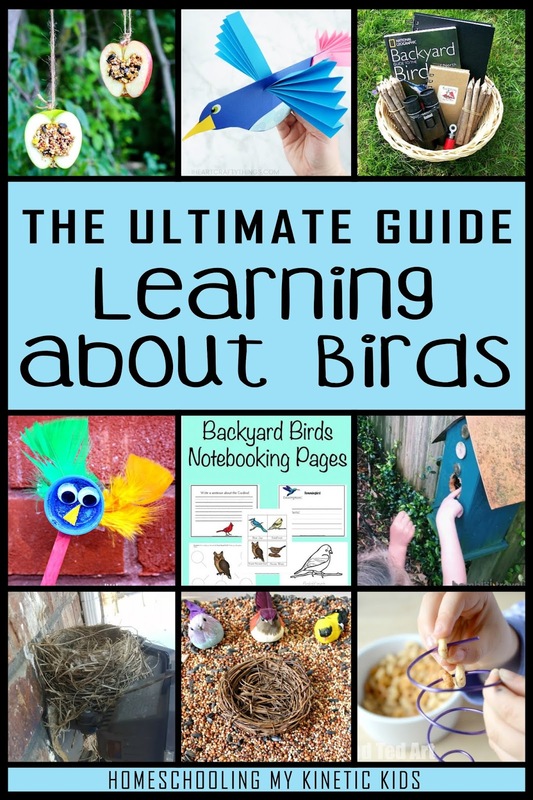 I also recommend the backyard bird flashcards or a guide book of your local wildlife. Many of these bird activities involve invitations to observe and build nests. It would be a good idea to have some books about nests available for inspiration. The Birds, Nests, and Eggs book looks especially helpful (the author also has many similar ones with different nature themes). Our homeschool co-op class just hatched chicken eggs, so my kids are ALL about chickens right now! They have been fascinated with the ways that the birds grow in their shells. 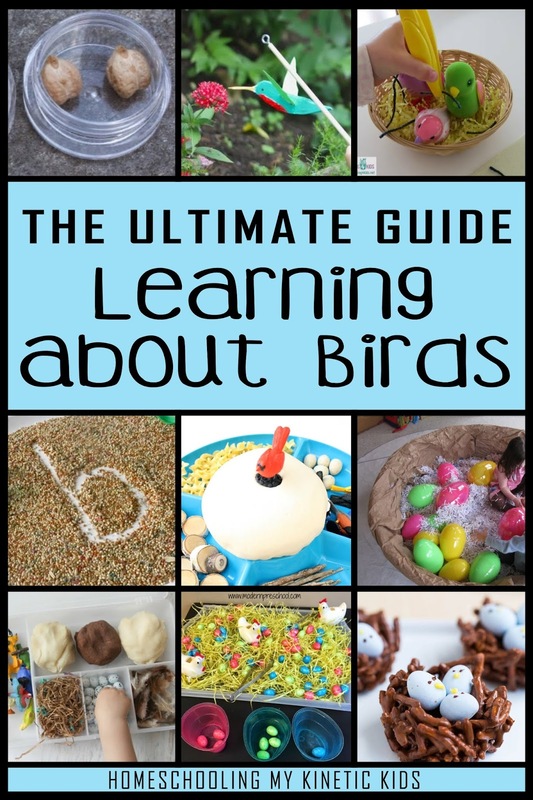 The co-op teacher had the Chick Eggs set for the class to explore, while we brought the life cycle book to share. 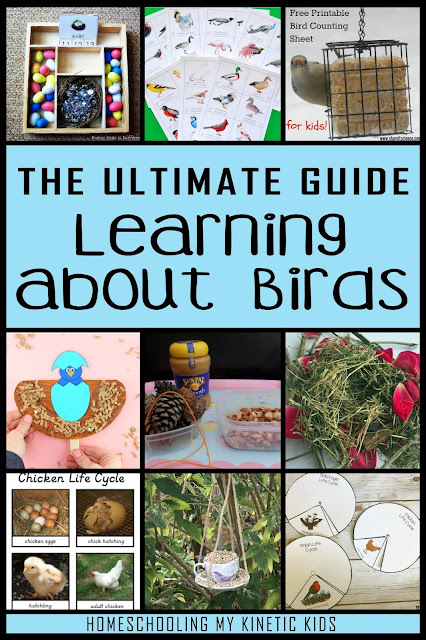 Be sure to grab the Montessori-inspired Chicken Life Cycle 3-Part cards on my blog which match the Safari Ltd life cycle set. 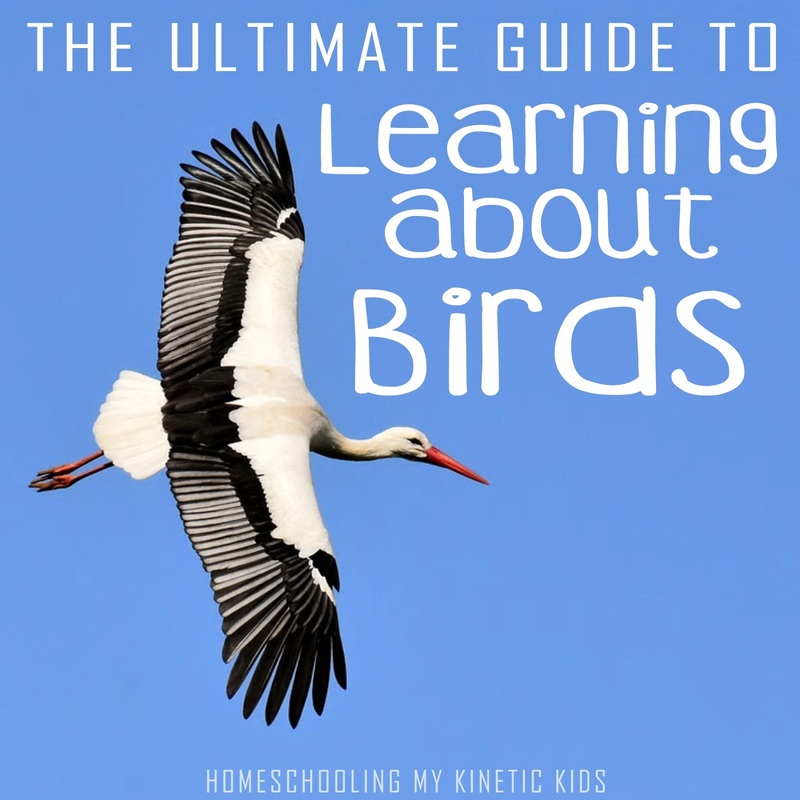 Whether you're observing birds at your feeder at home or watching them from a hide in a sanctuary, these field guides would be very helpful for identifying different species. Be sure to grab the right one for our region or get extras for places you visit (for example, we have one for Botswana). 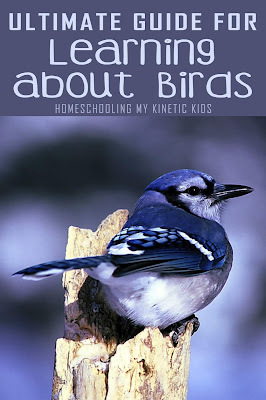 One way to make backyard birding and the science lesson more interesting for kids is with toys! Here are some suggestions. I especially like the plush birds with authentic sounds- it would be neat to have a whole collection of them. 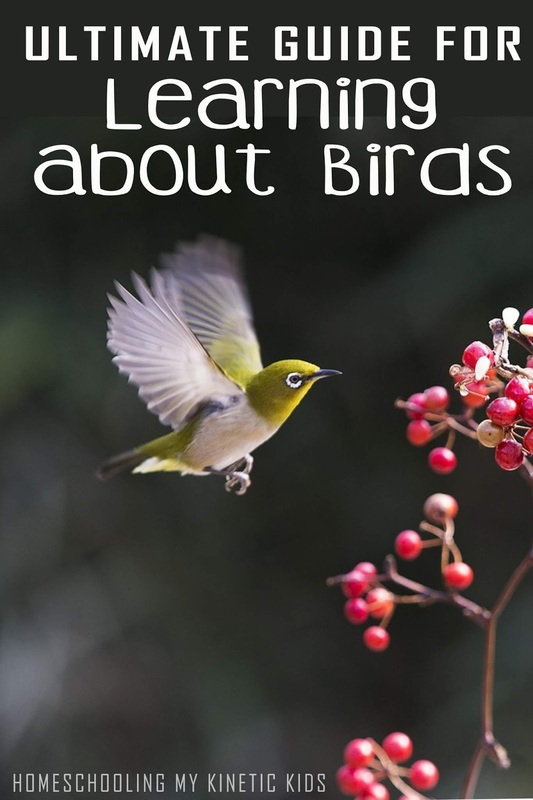 A great way to attract birds to your yard is with some bird feeders. 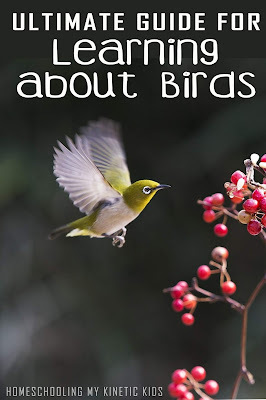 Different birds prefer a variety of food types or feeder styles. 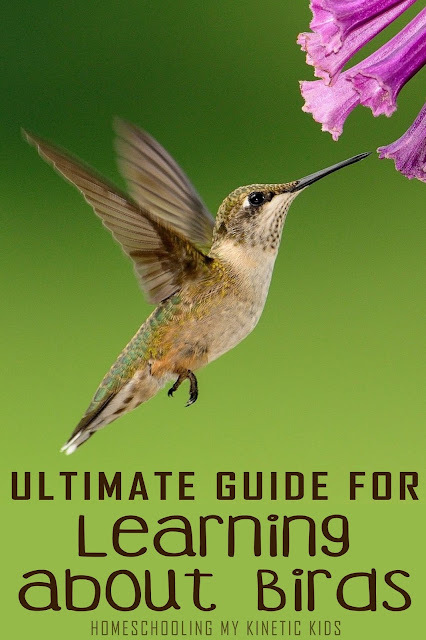 Be sure to get the right combination for the kinds of birds you're hoping to attract. A few nesting boxes would be a good idea as well. This is a great time of the year when candy eggs are in every grocery store. I'm stocking up on them for chocolate nests, math lessons, and our future dinosaur road trip. Whether you prefer chocolate eggs or jelly bean ones, this is the time to buy them. 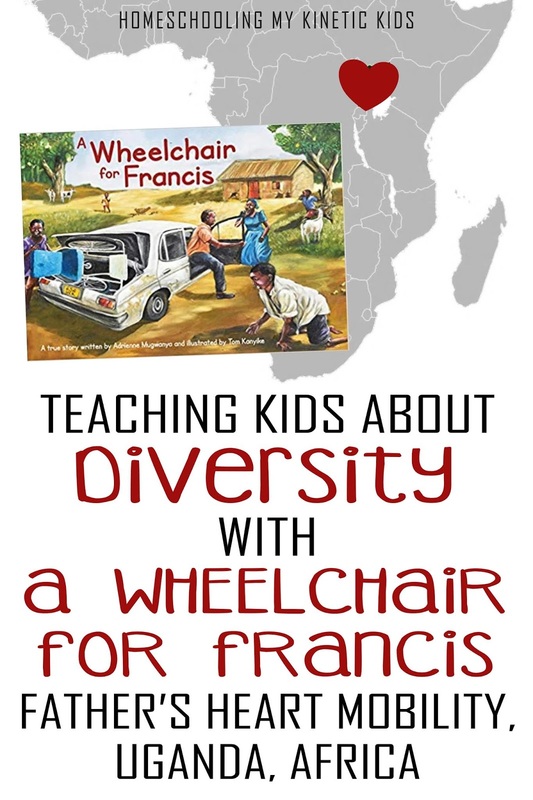 The blog post was inspired by a new book that was just published this week- A Wheelchair for Francis! The biographical story tells of a disabled Ugandan boy, who spends most of his life trying to get a wheelchair. He grew up being ostracized by his neighbors and told that he should not attend school or be seen by others. But, he never gave up on getting a wheelchair and being part of his community. Now, as an adult, he and his wife travel around Uganda giving wheelchairs to people, literally lifting them out of the dirt and giving them a new life. Francis's wheelchair ministry is called "Father's Heart Mobility." 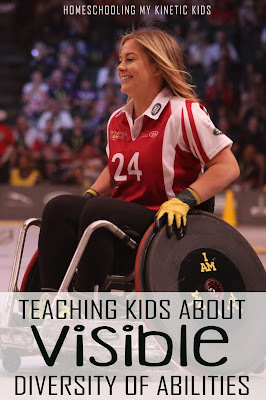 They work closely with Joni and Friends and other advocacy groups to provide wheelchairs for the people of his country and to speak with kings and communities about acceptance and accommodations. To date, Father's Heart Mobility has given over 12,000 wheelchairs out, but they estimate that there are still another 100,000 people in that country who need wheelchairs. Click the link below to read more about the ministry and to donate wheelchairs to those in need. As a parent and a homeschool mom, I'm always looking for interesting ways to teach my kids about the world. 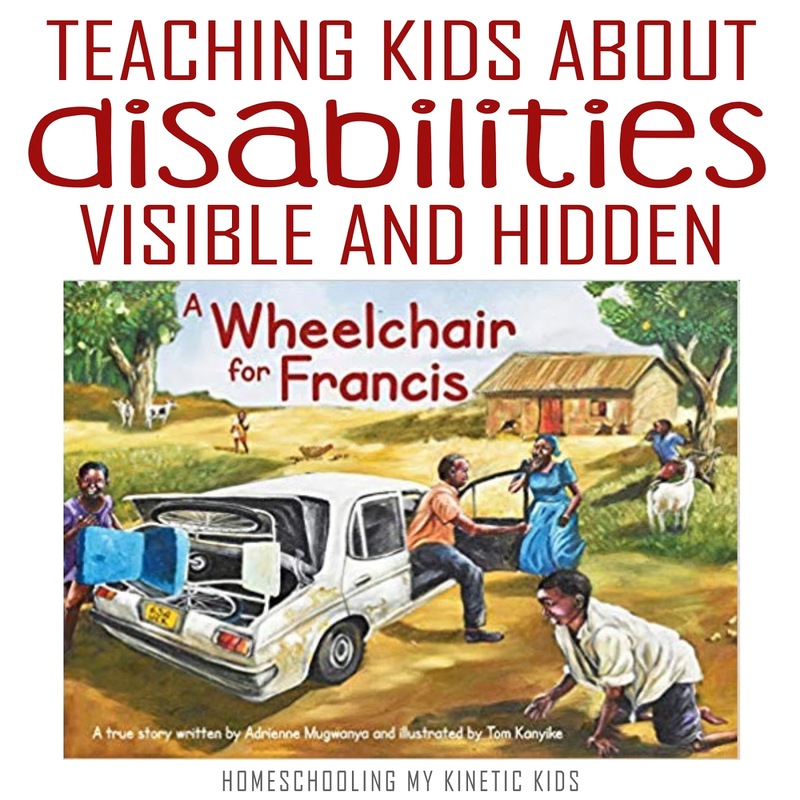 Much like how "A Computer Called Katherine" could be used to talk about parabolas and equality, "A Wheelchair for Francis" can be a springboard for learning about Uganda, Africa in general, and diversity of abilities. 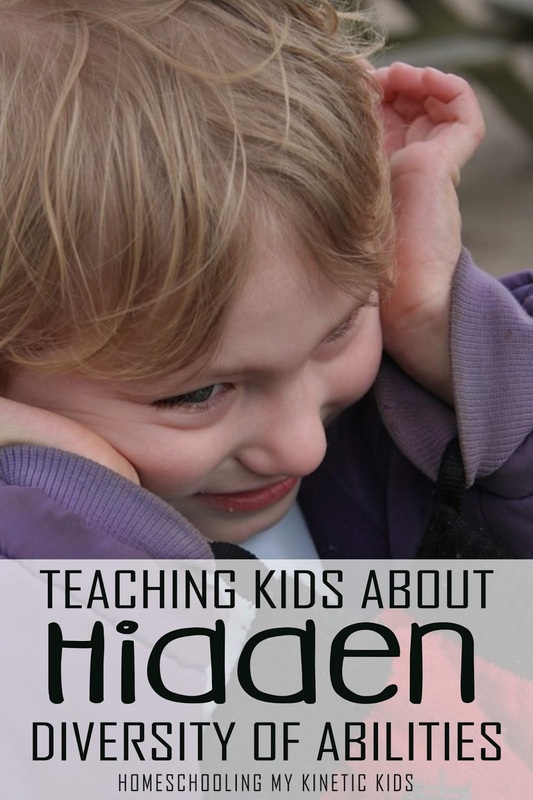 I was surprised how difficult it was to find good content for learning about disabilities. 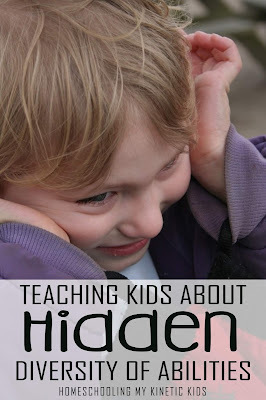 I reached out to the Kid Blogger Network to link-up all the posts that they had about the subject. 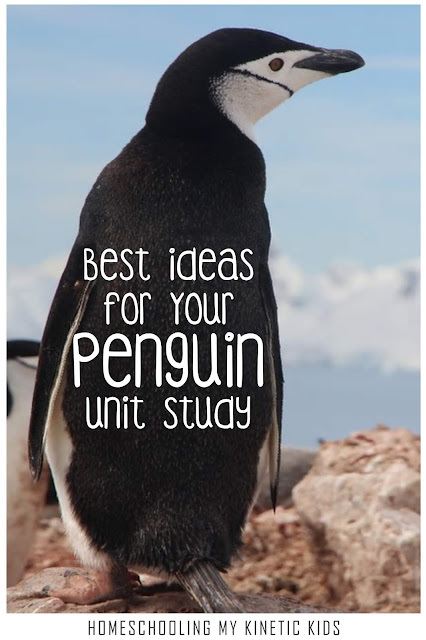 Then, I turned to Pinterest and Google for more ideas. 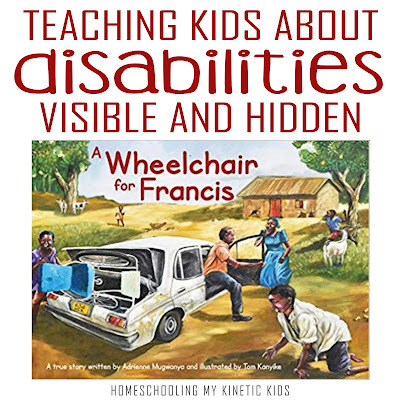 I really wanted to cover both visible disabilities, like the ones in "A Wheelchair for Francis," and hidden ones, like the ones some of my kids have. Below are all the resources that I've found with links for everything. One of the easiest places for us as parents to start when introducing diversity of abilities to our kids is movies. Discretion will need to be exercised on the part of the parents in choosing which video is best for your children, as some of them may be a bit intense or scary for little ones. 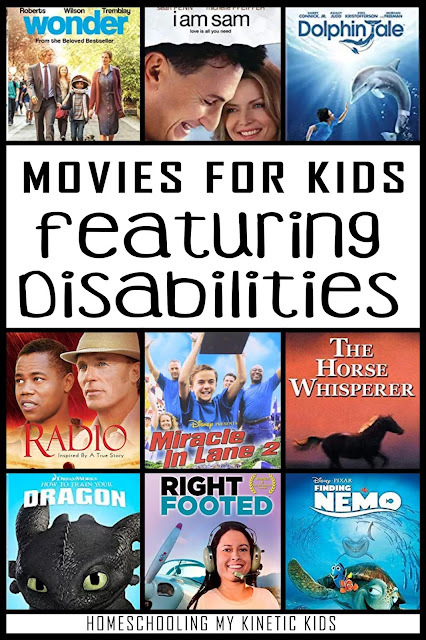 Each movie deals with a different type of disability, so I've listed each one next to the movie title. Click on the colored text to read the description and reviews on Amazon. It seems like hidden or invisible disabilities are getting a lot of press lately, and issues like autism and ADD/ADHD even have their own awareness months. Many of my blogger friends have children with "alphabet diagnoses," and they're sharing their posts with you below. Click on the colored text to visit the articles. 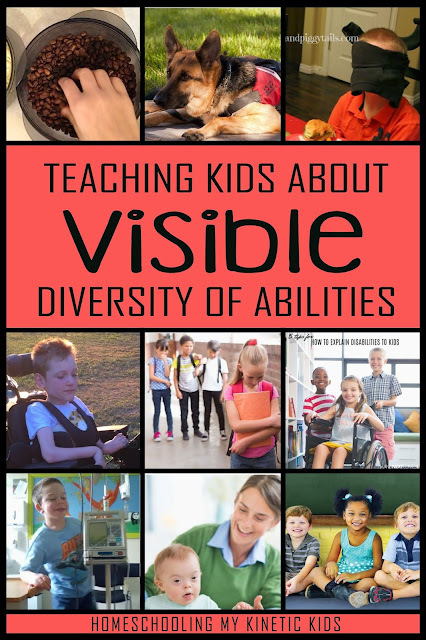 It was a lot harder to find blog posts about visible disabilities! 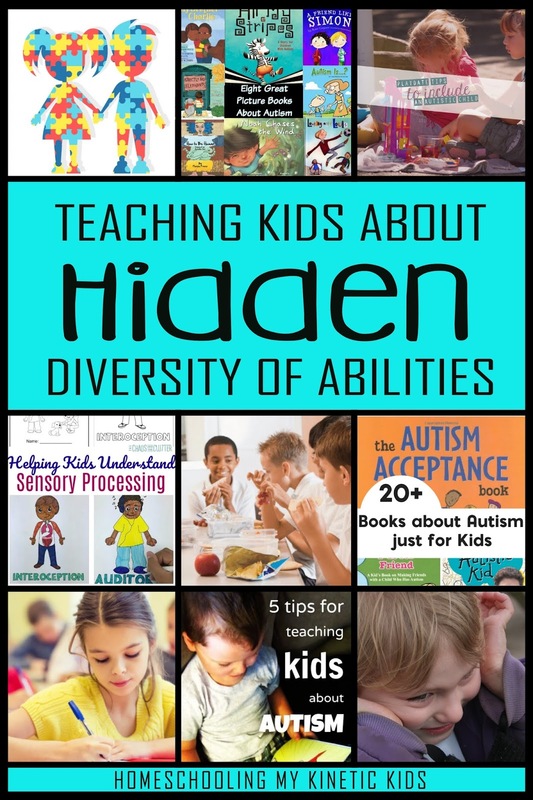 I specifically wanted articles that talked about how to teach children about the diversity of abilities, not how to teach children with those challenges. Almost everything I found was the latter. So you won't have to go looking yourself, I put all the posts below. Click the colored text to view them. Another great way to teach children about diversity of abilities is through play! 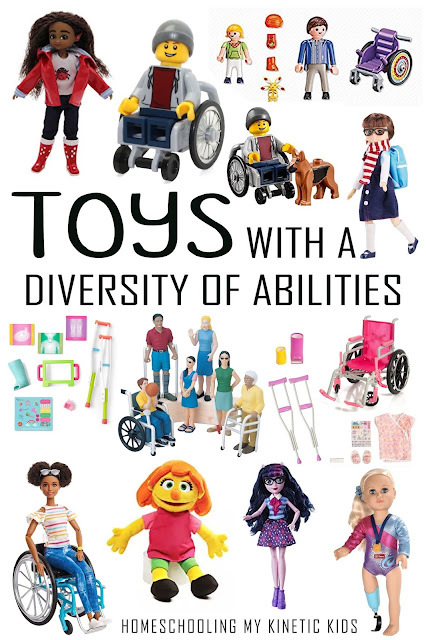 These toys feature various challenges and allow kids to express reality with their imaginations. Of all the toys, the Lottie Doll is my favorite, because she has a life outside of her disability and her cochlear implants don't slow her down from being a wildlife photographer. My Life As and American Girl both have quite a few differently-abled dolls in their online stores or for special order, but I like that Lottie is available on Amazon and many other places. I hope I've given you lots of inspiration and ideas for teaching your children about diversity and disabilities. Please leave a comment to tell me what is your favorite resource for teaching this subject. Don't forget to pin these images to Pinterest for later!